"She always got what she wanted, but when she had it, she destroyed it." 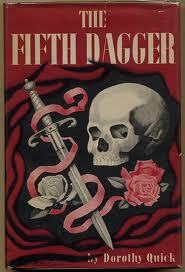 The Fifth Dagger is the first full-length mystery novel by this author, who is more well known for her poetry and short stories (including weird tales). Personally speaking, I wasn't awed by this book, which was kind of silly in the long run and chock full of melodrama. But Dorothy Quick isn't that well known for her novel -- her major claim to fame is in her relationship with Samuel Clemens, aka Mark Twain. She chronicled her experiences in a book called Mark Twain and Me (1961), which 30 years later would become a Disney TV movie of the same title. Just as an FYI, the article also cautions the reader that while this may sound creepy nowadays, the girls in question were part of his Aquarium Club; collectively they were known as Angel Fish and were properly chaperoned at all times. But I don't know...there's just something about an old guy wanting to be around young girls that's just sort of bizarre to me. But I digress. Quick split her adult time between New York City and East Hampton; she married in 1925 but continued to write under her maiden name. She died in 1962. The Fifth Dagger begins with the newly-married Diana Blakely (the narrator of this story), who has just recently tied the knot with psychiatrist Allen Blakely. As the story opens she is being "introduced" to "Boston society" at a charity ball. Out of nowhere, in walks the beautiful Honora Davenport, one of the Boston Davenports, and it becomes apparent to Diana that Honora and Allen have a history that he's sort of forgotten to tell her about. He rectifies the situation later that night, but only after Honora slaps her and after someone shoots at the newlyweds as they're getting in their car to leave. He reveals that Honora is suffering from some strain of inherited madness, and that he was one of the doctors helping her before she went a little psycho and fixated on him as a potential husband. Despite Honora's family physician telling Allen he should marry her to help her with her illness, Allen's not having any part of the plan, and has to go into hiding until Honora gives up looking for him and moves to California. She may have given up trying to find him, but it's clear to everyone that she hasn't given up on her fixation with Allen, even though in the meantime she married an actor from Hollywood. Although his account quells Diana's jealousy (I did say melodrama, right?) she is surprised one day to find the Davenports (Honora and her brother Bruce) in her living room, inviting her to attend a Cotillion that Honora is throwing at her family home. She's even more surprised to find herself accepting the invitation, but she and Allen trot off to the party. Bad decision, Diana. Honora throws herself at Allen and monopolizes him the entire evening, and they pair up again on the dance floor where Diana notices that they're dancing too closely together. While she's watching her husband with the woman who's obsessed with him, Honora suddenly falls in what appears to be a faint. But as it turns out, she's been stabbed in the back -- and the murder weapon turns out to be one of the daggers given away as party favors. The police arrive, and it isn't long until Allen becomes the chief suspect, but the Lieutenant asks for Diana's help with the case -- it seems that not too much earlier than this, she had solved the murder of her sister and has made a name for herself among law enforcement. Of course Diana will do anything to help clear Allen, but things progressively get worse for both of them as the long night continues on. 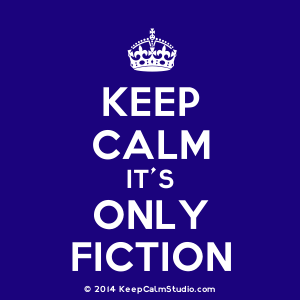 The first word that comes to mind when considering the novel as a whole is "cockamamie," as in ridiculous, incredible and implausible. I have several reasons for making this call, but nothing beats this one: the night that Honora is killed at her family home, Diana and Allen stay overnight there in a guest room, and Diana even borrows a new nightgown from the dead woman's wardrobe. There's more, but it has to do with the solution to the murder so I can't go there. Trust me -- if you ever decide to read this book, you'll do more than a few eyerolls as you move through the story, especially as it winds down to its denouement. Speaking of which, Dorothy really let me down here since she made it so easy to pinpoint the murderer well before we're anywhere close to where that should happen. And I do mean easy. Sheesh -- she should have illustrated the particular page with a red neon arrow flashing over the murderer's head! As it stands, though, I did find another crime-writing woman author I'd never heard of before, so that's a plus, and I also discovered that Mark Twain had a thing for young girls. Now THAT is something I need to read more about. I'd say if you're truly truly a diehard vintage-crime addict like I am, The Fifth Dagger is worth a shot but do keep in mind that it's a wee bit on the odd side. What a cool collection idea! I collect pink pigs. I'm strange. Nancy, it looks interesting, but I quite agree about the older gent; in fact, I am uncertain whether or not we have become sensitive to this issue or if you are making a good point. The thing with Mark Twain is just a sort of "hey - I never knew this before" kind of FYI that I found interesting. But I'm seriously going to look into it. They were, after all, completely chaperoned. I would be curious what you find. Society adjusts with the times, but then again, Clemens wrote about young kids, too, Many we are all hyper attuned, but then again, maybe in the past, society was just too naïve. Skye, I'll definitely let you know what I discover. As it turns out, Larry's gone most of August so I actually have a lot more time than usual.